Lawton Christian School is an independent, co-educational, interdenominational, non-profit, Christian day school for students in grades PK-3 - 12. It was founded in 1976 and currently has 400 students. 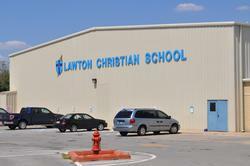 Lawton Christian School was founded in the fall of 1976 in the basement of Lawton Christian Fellowship (now known as Grace Fellowship). After a couple of years, the school moved to its present location in what was then a metal barn used for auctioning cattle on the Wilson ranch. With the help of parents and church members, the building was renovated to accommodate school classrooms and a gymnasium. A few years later, Harold and Dorothy Wilson, who had become aware of the importance of Christian education, agreed to take over the operation of the school, and Lawton Christian School became independent of any church or denominational affiliation. In the next few years, facilities were established to allow the secondary school to expand and become separate from the elementary school. In 1999, the LCS elementary and secondary facilities were severely damaged in a storm. However, this presented an opportunity for the school to be enlarged. Secondary classrooms were added, and the elementary school was moved to its present location. Even the original building was completely rebuilt and is used as a multipurpose facility by the preschool. 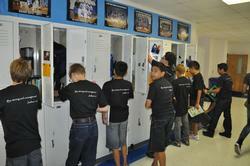 Lawton Christian School has expanded to include students from Lawton and Ft. Sill and many outlying communities. Presently the students and faculty represent approximately 60 churches and various cultural and ethnic backgrounds.